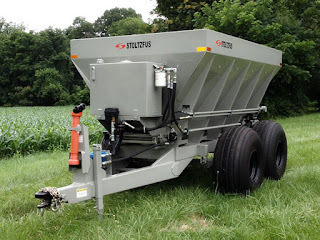 Stoltzfus spreaders manufacture the various of spreaders with a unibody, fully welded design, proven material delivery system, rugged spring or walking beam suspensions, heavy duty drive trains, and top mounted spinner motors which combine to create a spreader that is rugged enough for lime, gypsum, poultry manure, fertilizers and many more. 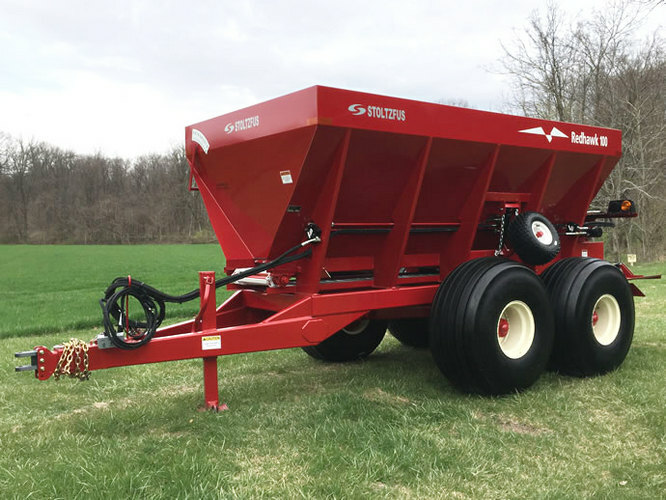 These premium Stoltzfus spreaders have earned an excellent prestige in the farm community, both in the United State and abroad. 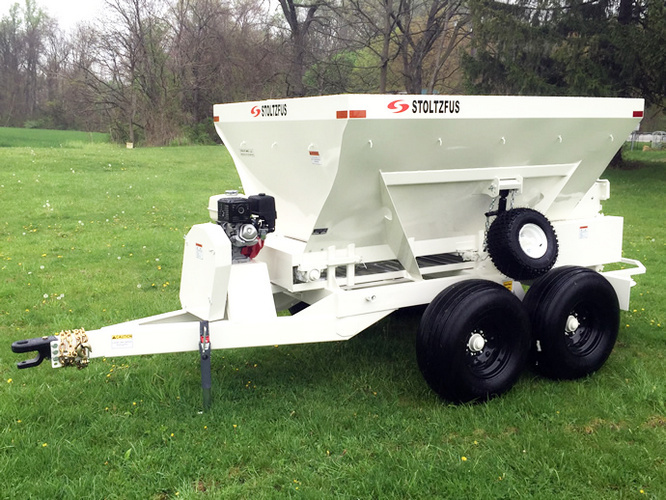 Headquartered in Morgantown, PA, Stoltzfus Spreaders has been providing spreaders to global agricultural markets for 70 years, longer than any independent spreader manufacturer in America. All products are made in the U.S. 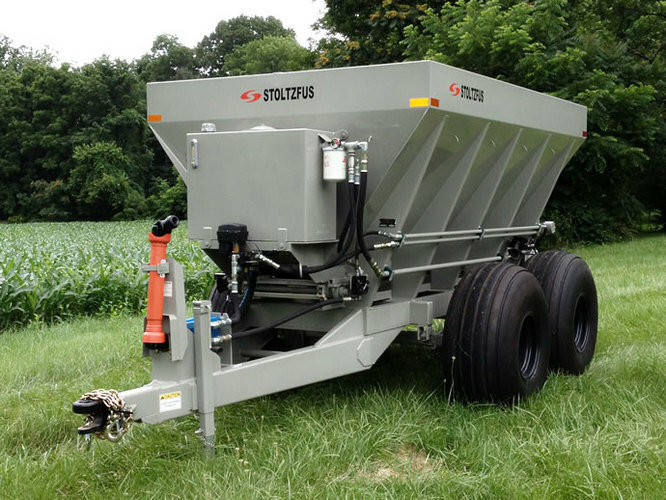 The following is the products of Stoltzfus spreaders. For farmers who are dissatisfied with light duty spreaders, the Wet Lime Spreader (WLS) is a machine that is built for spreading wet or damp agricultural lime. Unlike a fertilizer spreader, the Wet Lime Spreader has a 24 inch wide conveyor and steep, 53 degree side slopes and a 4” drop pan to prevent material bridging in the hopper. The Wet Lime Spreader (WLS) is designed to pay for itself based on the difference between custom applied lime and spreading it yourself. Farmers typically back-haul lime from the quarry and dump it in the corner of a field for spreading at a later date. The lime does not need to be kept dry, and can sit for months until needed. The lime can then be spread when conditions are right instead of waiting in line for the custom applicator to come around. The WLS spreaders are available in all PTO mechanically driven, plug to tractor hydraulics and PTO over hydraulics, whichever best suits your needs. Spread rates are determined by ground speed and rear metering gate height, and a constant ground speed is required to maintain a consistent spread rate. Designed for farmers who don’t want to own separate spreaders for lime and fertilizer, the Redhawk spreader is a combination spreader that can handle both materials. In addition to, the Redhawk can be used as a seed spreader. Unlike dedicated spreaders, the Redhawk units are rugged enough for lime yet precise enough for fertilizer. 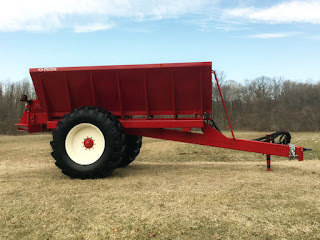 The Redhawk ground drive lime and fertilizer spreader features a double-contact press wheel that provides enough power to break free a packed load of lime, while still providing the ground drive precision you expect in a fertilizer spreader. The body chain (conveyor) is driven by a press wheel that contacts both ground wheels on the walking beam suspension, providing extra traction. The press wheel is operated hydraulically from the tractor to start and stop the spreader – no ropes to pull! The spinners are powered by tractor hydraulics or PTO mechanically driven. Spread rates are determined by the gate height, and the ground drive mechanism ensures a constant spread rate regardless of travel speed. 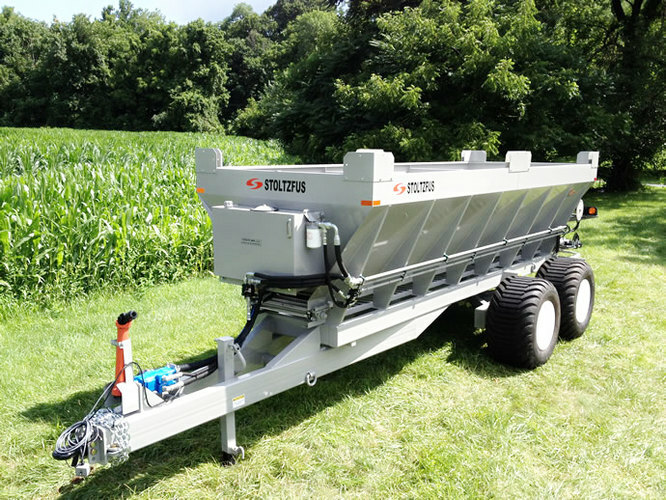 BMS spreaders are available in a multitude of power configuration from PTO mechanical, plug-to-tractor hydraulics and full PTO over hydraulic systems. Whichever best suits your needs. Spread rates are determined by ground speed and gate height, and a constant ground speed is required to maintain a consistent spread rate. All BMS spreaders come standard with a heavy duty walking beam suspension. The large hoppers, 30 inch wide body chain and 16 inch high rear gate opening allow for high spread rates of light, bulky materials, while the rugged driveline is designed to handle lime. The original boom style drop spreader creates a level spread pattern right to the edge of your field with no overlap required. Unsurpassed accuracy for dry, flowable or dusty materials like dry pulverized lime and crushed stone fertilizers. This design reduces dust and mid-air separation of light and heavy particles. Featuring a self-contained PTO hydraulic drive system, the boom spreader has been redesigned for simplicity and reduced moving parts. 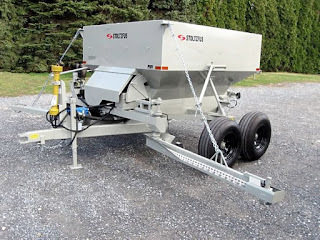 The spreader features a 30 foot wide spread pattern using a conveyor-style boom. A level spread pattern is achieved because the conveyor boom returns excess material rather than splashing it out the end. The Row Crop Spreader Series is designed for growers who need wide swath spreading of lime and fertilizer, and want the ability to top-dress on standing crops. Fully adjustable axle allows new wheel spacing should your row width change in the future. All RC spreaders come standard with Cor-Ten HSLA weathering steel hoppers. The RC-8010 and 1516 are designed for spreading damp stockpiled lime. The steep 53 degree side slopes and 4"drop pan combination prevent bridging. It will also spread fertilizer, compost, litter and more. The larger volume RC-8012 and 1520 are designed for 8 and 15 tons of fertilizer while maintaining the ability to spread other materials. The spreader comes "variable rate ready", so just needs to be hooked up to the monitor in your tractor. Stoltzfus Spreaders recognize that there are times when you have unique needs that standard equipment will not meet. Feel free to give us a call to discuss your special requirements. Special projects Stoltzfus Spreaders have been involved in include spreaders for Amish and Old Order Mennonite customers who require steel wheels and engine drives, mounting spreaders on specialty vehicles like log skidders, specialty drop spreaders for high spread rates and hoppers for customers to incorporate into their own equipment. 0 Response to "Products of Stoltzfus Spreaders"